Finished up my blocks for May! This ginormous tulip block is for Penny. It is 18x18 inches, bigger than you might think from the photo. Someone commented on flickr that it looks like an elephant. Funny, huh? I had to do a substantial, tulippy leaf there. These two will go to Mary in the Block Swap 2 group. She said we could use decorative stitches on these if we want, and I love how it looks. Especially the one with darker thread. This could be fun on a mini-quilt... someday, maybe. I had to get a little creative for the block on the left, I was running out of larger pieces of fabric so I pieced a couple of the strips. These are foundation pieced on printed muslin fabric. I haven't done foundation piecing for a long time, it's different than using paper! And, I decided to get on the ball with a couple more UFOs for the Spring to Finish challenge. I collaborated on this placemat with my oldest son, who's 10 now (he was 9 when we started). It's been sitting, partially quilted, for a long time. 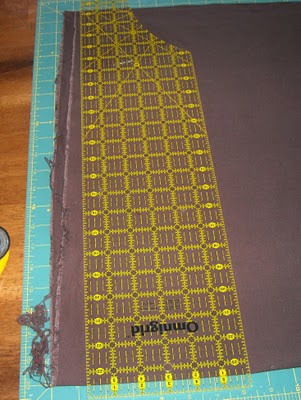 I finished it up today, including machine-finished binding. I'm not sure if that's why it ended up so wavy around the edges. Maybe it will shrink up after being washed. I also pulled out the pieces of the green placemat I had started for the 5-year-old. He helped sew one important seam in it tonight. The top needs one more strip added so it will be the same size as the blue one. I am thinking of binding it with yellow. And, really, in the spirit of not letting projects drag on for ever and ever. I'm going to get on it and finish my 9-patch quilt. Right now the plan is to make 7 of these each week. I'm hoping to get them cut out so I can use them as leaders and enders while I'm doing other projects. I had 31 finished before today, and pulled the fabrics out to make 11 new ones. 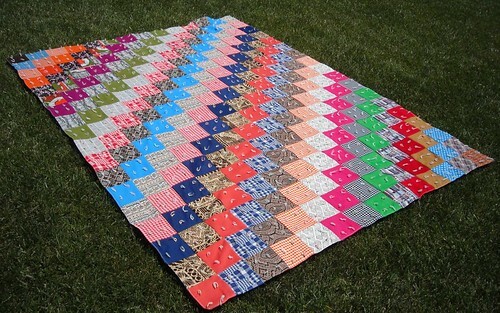 I'm planning on making this quilt which calls for 70 nine-patch blocks... so a little more than 5 weeks. Unless I make them faster. I'm excited for when this quilt will be done--it's going to be so pretty. 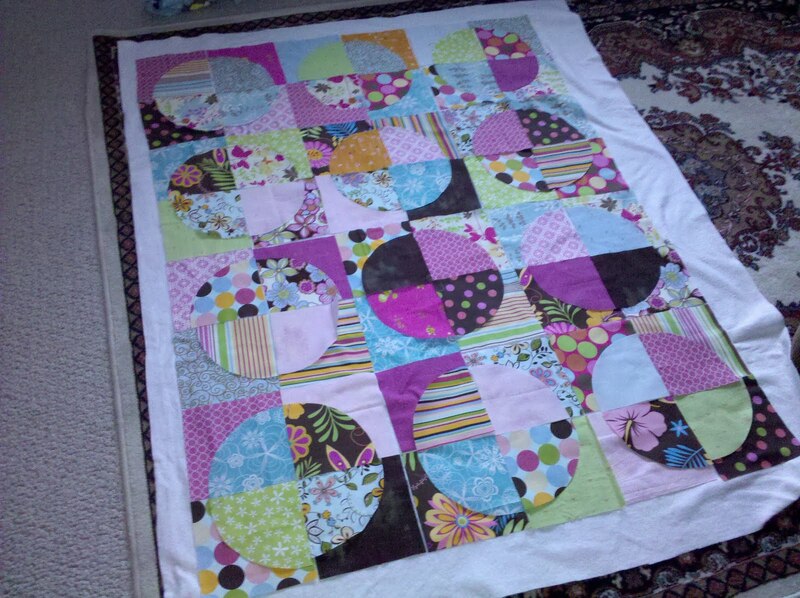 Here is the 4th row of the circle quilt for my not-yet-born niece. It turns out that these blocks really needed to be squared up, I assume because the process of sewing the two curved pieces together stretches the fabric. I started sewing the first complete circle without squaring or trimming the subunits but decided I needed to undo it and get the subunits down to their correct size first. It takes some time to trim them down so I decided to do 3 complete circles today and I plan on trying to get 3 done each day for the next few days, too. We'll see how that goes. I'm calling it the 4th row because it's the bottom of the quilt. But it's the first one I've actually sewn. 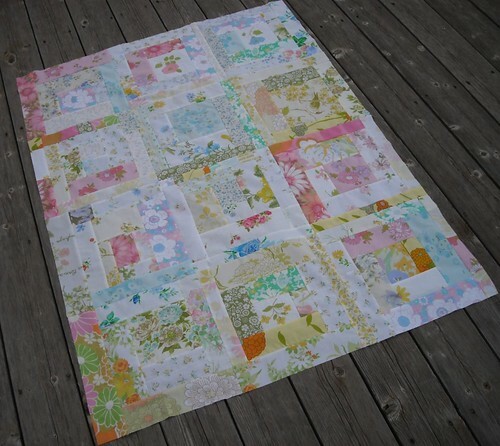 This quilt is inspired by the roundabout quilt-along by Amy over at A Commonplace Life. 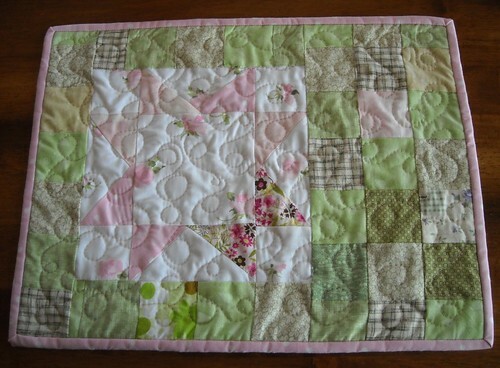 I love the first quilt she made and have wanted to make a similar circle quilt ever since I first saw the one she made. When I found out my sister-in-law was having another baby I eventually decided I would like to make her a circle quilt, and I was excited when we talked about it and she said she liked the roundabout quilt too. But when I went back to the tutorial I found that the blocks--the quarter-circle blocks--finished up at about 11 inches. I like to make baby quilts somewhere around 36x42 inches, and an 11-inch quarter circle block seemed way too big for the quilt I wanted to make. This time at least. So I did some drawing and figuring, and decided I would go with 6-inch finished quarter circle blocks, 48 of them, for a baby-sized quilt that will end up about 36x48 inches. So here's part one of designing your own circle quilt--first you need to decide the size of quilt you want. If you want to make a standard bed sized quilt, go ahead and do a google search of quilt sizes. 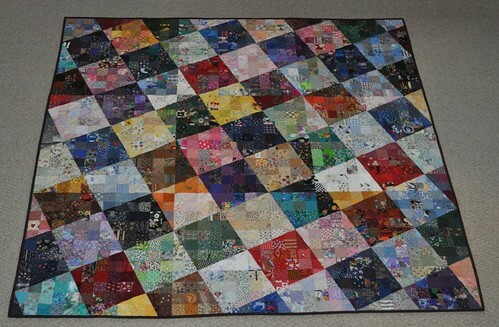 Most of the quilts I make are baby quilt size (around 36x42" or slightly bigger) or throw size (I like to go with 50x70"). 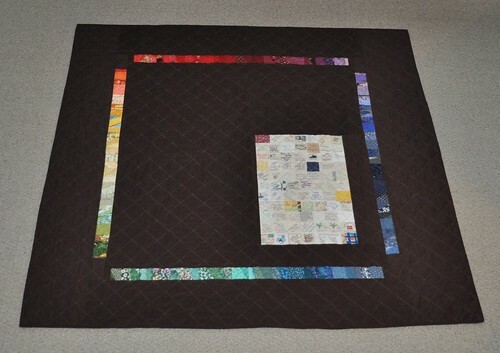 From there, think about what size of quilt blocks will fit within those finished quilt dimensions. If you want to have all the blocks made into groups of four that look like circles, you'll need to keep that in mind. There are other layouts you can use though--you can check out the roundabout quilt pattern flickr group for some ideas. 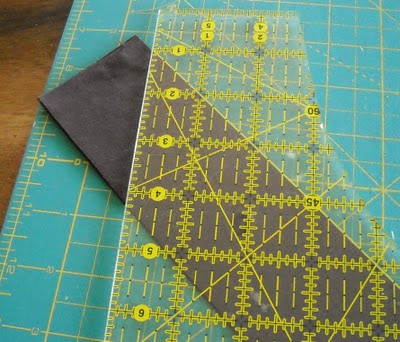 It might help to draw out your quilt to get a rough idea of how it could look. Don't worry about having perfect drawing skills, just get your idea down on paper. If I can find the original little sketch I made for this quilt, I'll take a picture of it to show you. 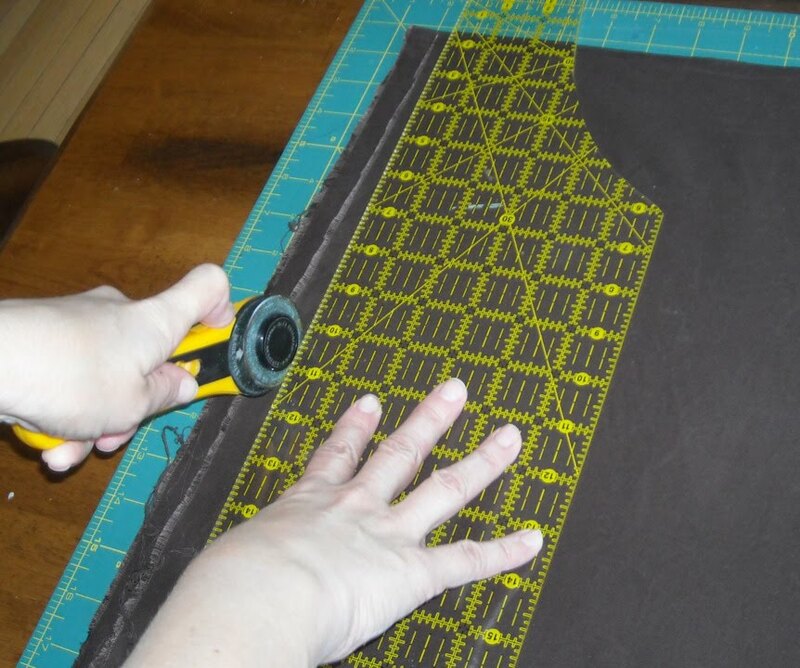 In the next few posts I'll write about calculating the fabric yardage you need, drawing and making your template, cutting your fabric, and piecing the quarter-circle units. I'd love to hear from you if you think you'll make one of these quilts--what size of circle quilt are you thinking of making? 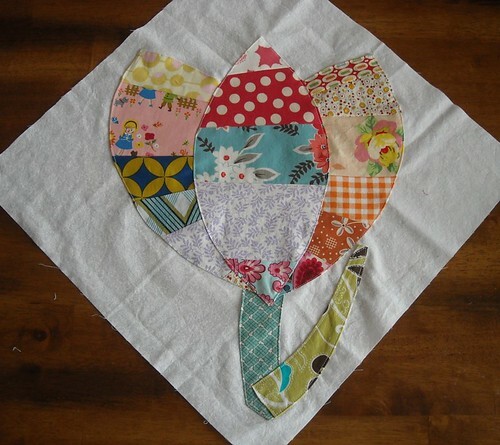 Thanks so much to Amy for hosting the Blogger's Quilt Festival! Finally, I finished my Insane Quilt Project! Its official name is Y2K10. It is about 62" square. 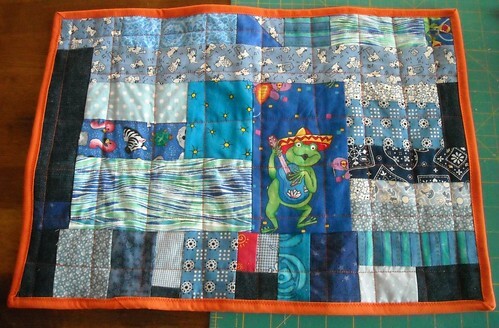 I started this quilt in early 2002, late to the Y2K charm square swapping party. 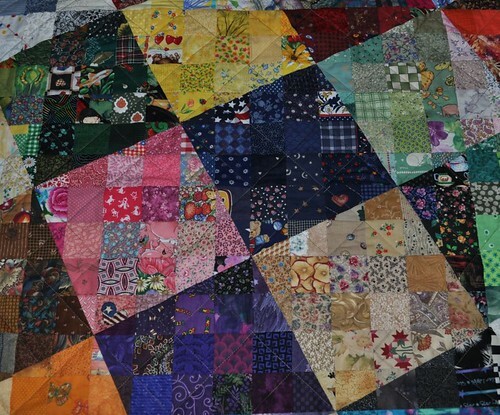 Back then, there weren't really any quilt blogs but quilters were hanging out on quilt message boards on sites like quilting.about.com. 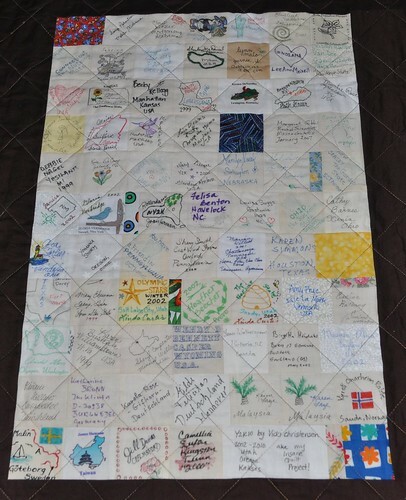 Lots of quilters were swapping 2 1/2" or 3" charm squares in order to make a Y2K quilt with 2000 different charms. There were even magazine articles about how to join these swaps. Mostly people would send out sets of 25 different fabrics, plus a signature square. 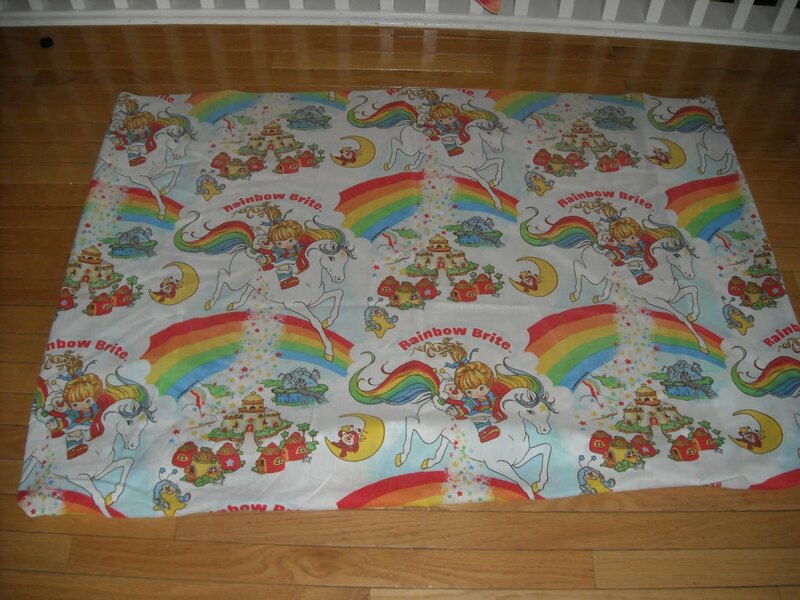 It was a fun, and really inexpensive way to get a hold of a large variety of fabrics (this was important because we had a tight budget during those grad school years). Each swap was set up individually via email (there would be lists of people willing to swap on various websites), and a lot of people sent a little typed up biography of themselves with their squares. I found the pattern in the May 1999 issue of Quilter's Newsletter Magazine--it is called Colourwash Checkerboard and was designed by Deirdre Amsden. (I modified the pattern slightly for my quilt.) This back issue is no longer available on the QNM website, but you might be able to find it elsewhere. The designer wrote a book titled Colourwash Quilts: A Personal Approach to Design & Technique which is available used on Amazon, if you're interested. 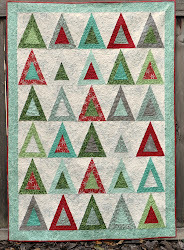 It was a really time consuming quilt to make--I cut every single piece individually--the triangles and the square-minus-triangle-chunk shape were each cut with templates, and the squares were 2 1/4" before sewing, so I had to cut each square piece down to size too. If you look closely you'll see the quilt is made of 9 sub-units, and each one is made of several different blocks of colors. 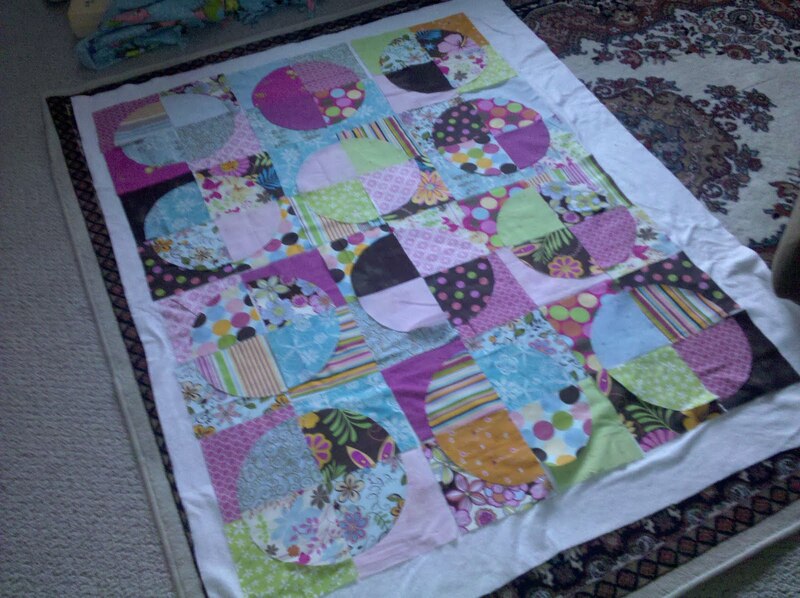 I pieced each color block together first, then made the large sub-units, then pieced the whole thing together. Here's the back. I just made the back a couple months ago. I used leftovers and scraps to make the rainbow strips. 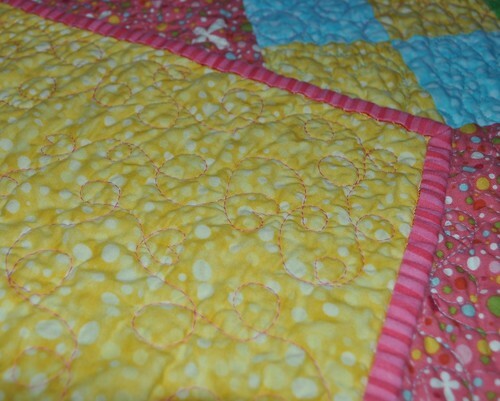 This photo shows the quilting better than the front, too. I didn't want the quilting to take away from the fabric and color so I chose to do a simple grid design. I quilted it with tan/blue/brown variegated King Tut thread that was recommended by Debbie at my local quilt shop. I had thought I would use a gray, or a gray variegated thread, but I'm glad I went with this one. I quilted it with my old Viking 100 machine, using the walking foot with the presser foot pressure slightly loosened (having it slightly loosened made a big difference and I didn't have any problems with the layers shifting as I quilted). I used painters' tape to mark my lines, and quilted diagonally through the squares on the front of the quilt (every other diagonal row). This didn't necessarily translate to perfectly straight lines, but you can't tell that from the front. 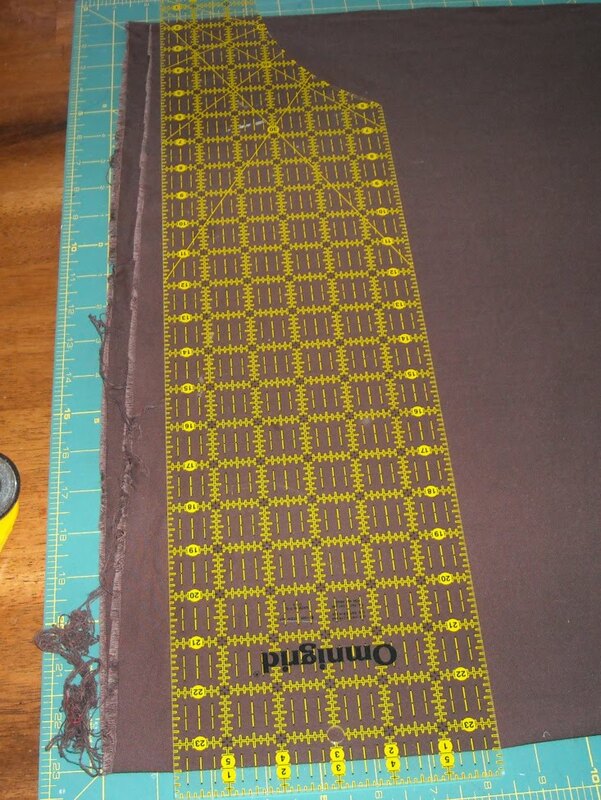 The main backing fabric is a brown quilter's only solid from JoAnn. 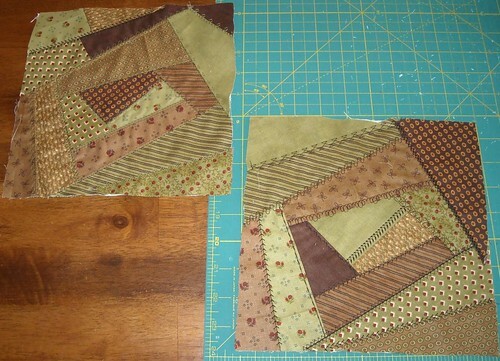 I used this same brown on my figgy pudding Christmas quilt that was finished at the end of 2009. Here's the signature block. I received a total of 71 signatures from 37 US states and 7 other countries. Aren't they great? I love the variety--handwriting, transfer/printing, stamps, embroidery, fabric paint. This is the center section of the quilt, it's the first section I made. I made the navy blue color block in the middle first. You can see the small template shapes a bit better in this photo. If you're interested in getting a closer look at the whole quilt, I've posted photos like this of the 9 quilt sections on my flickr account. The process of making this quilt was a real education in color and value. I first sorted my fabrics by color, and then value (lightness to darkness of the color). The fabrics in this quilt were divided by their value into lights, medium-lights, medium-darks, and darks. I kept the sorted fabrics on quarter sheets of posterboard that were stacked on top of each other and stored in a cardboard box that fit the posterboard just right. This was really helpful for keeping the project all together and made it easy to take it with me too. I started the project in Utah, took it with me when we went to Oregon in the summer of 2003 for my husband's graduate school internship, continued in Utah for another year, and then brought it out here to Kansas. Sometimes I wonder what it would look like if I hadn't sorted by color, and just done it by value. I think that if the fabrics hadn't been sorted by color first, some of the fabrics would have ended up in different value categories--I'm thinking about the yellows here. I do love how it ended up of course, but I think it would be interesting, someday, to make a "values" quilt where the values were focused on more than the colors. Now that I'm done... for a long time I've said I would start a Dear Jane quilt as soon as I finished this one. I don't think I'm ready for that yet--maybe after I finish a few more projects! If you have any questions about this project I'll answer in the comments! 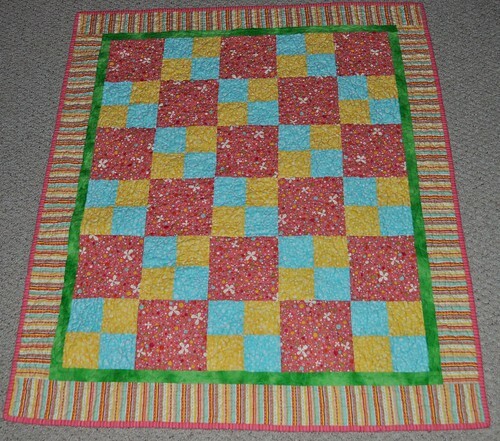 Thanks so much for stopping by my blog today, and enjoy looking at all the Quilt Festival quilts! Thanks so much for visiting my blog! 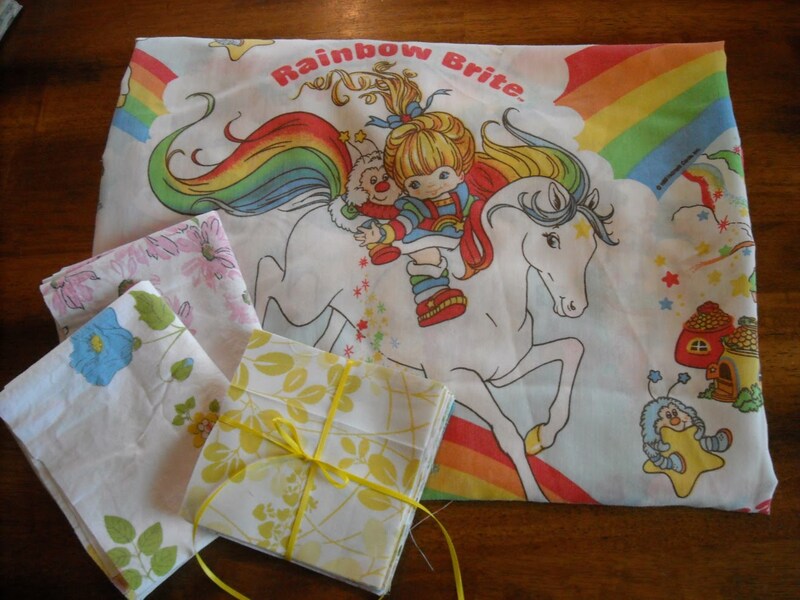 I have a few vintage sheet goodies that I hope one lucky winner will really enjoy! I tucked under the edges in this photo to make it look a little more neat--so you'll be getting a bit more than what you see here. There are about 5 duplicate prints in the charm pack. I am willing to ship internationally, and you can enter until May 20. If you'd like to enter, please just leave a comment below! Please make sure your email address is available in your blogger profile or include it in your comment, please. Sorry I haven't posted for a while! I wanted to post this a few days ago but I haven't been feeling the greatest. I'm glad to be feeling mostly better now though. This is one of my finished projects I didn't get around to showing yet. She cracks me up. 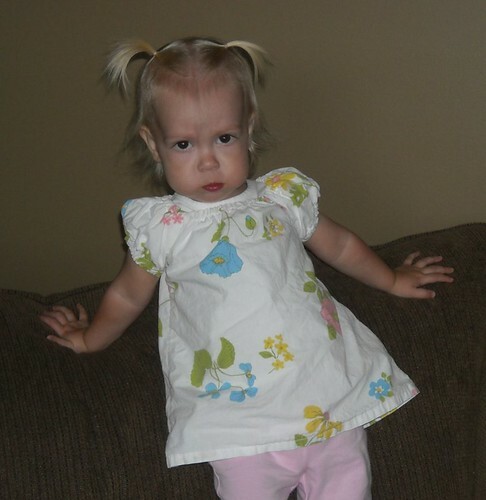 The shirt is the project, by the way--it's modified from Simplicity 5695. I made another one of these for a friend and am going to make one more for another friend and swap for some hairbows. Check back tomorrow morning for my giveaway post! And don't forget to visit sewmamasew.com for links to lots of giveaways starting tomorrow! I decided to make a tutorial for rotary cutting for left-handers--hope this helps some of you out. If anyone has any questions or needs more help on this, please let me know--I'm glad to help! When rotary cutting, always cut away from your body. Close the protective cover on the rotary cutter every time you put it down. Every. Time. Thank you. If you have kids in your house, put the rotary cutter up high when you are stopping working with it, even for a short time. I started out with a fairly long piece of fabric that was also the complete original width. 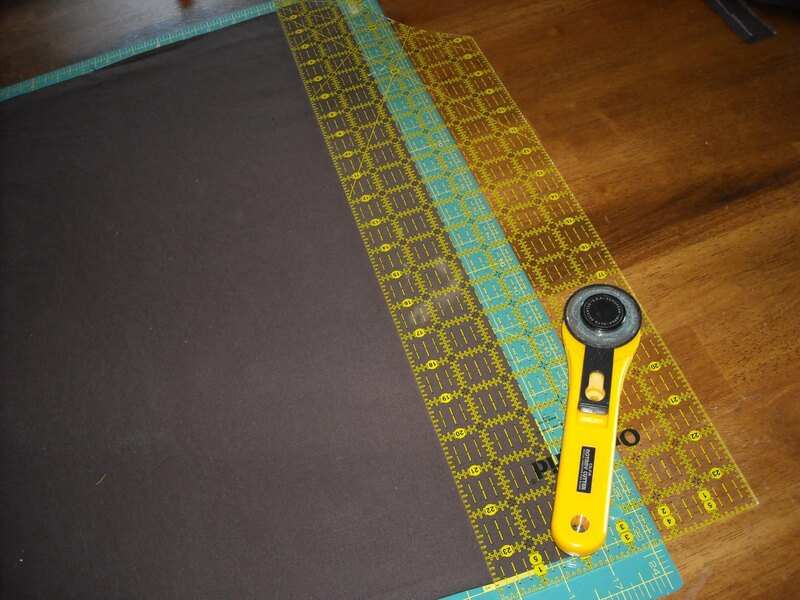 I needed to straighten my edge so I could get straight strips that went across the whole width of the fabric. First I held up the fabric, with selvedge edges together, and adjusted the two top corners until the selvedges were parallel and there were no ripples in the fabric. Amy has a tutorial just for squaring up fabric here, if you want to read more about it. 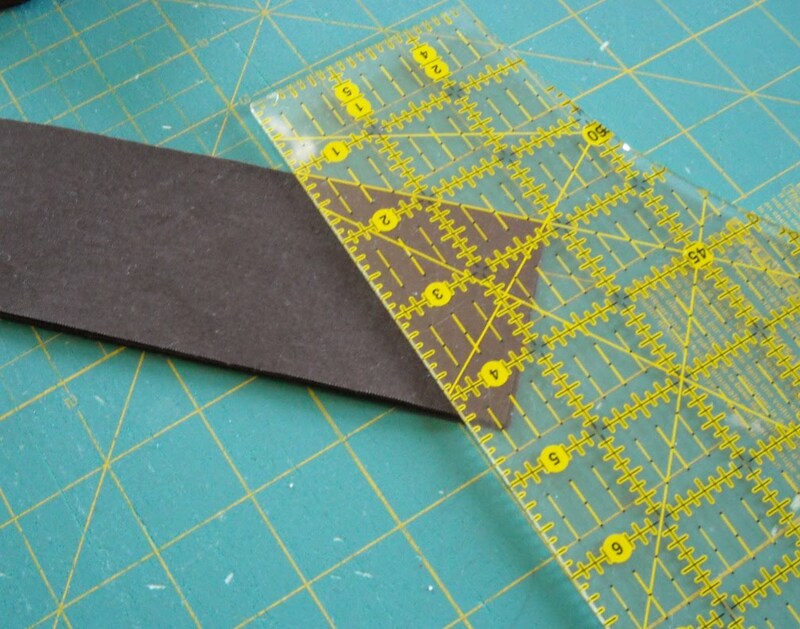 For left-handed rotary cutting, you will always cut on the left side of the ruler, while holding the ruler firmly in place with your right hand. (This action shot courtesy of my 5-year-old.) For long cuts, after you have cut up to where your fingertips are on the ruler, pause for a second and carefully (don't move the ruler!) move your hand higher up on the ruler. 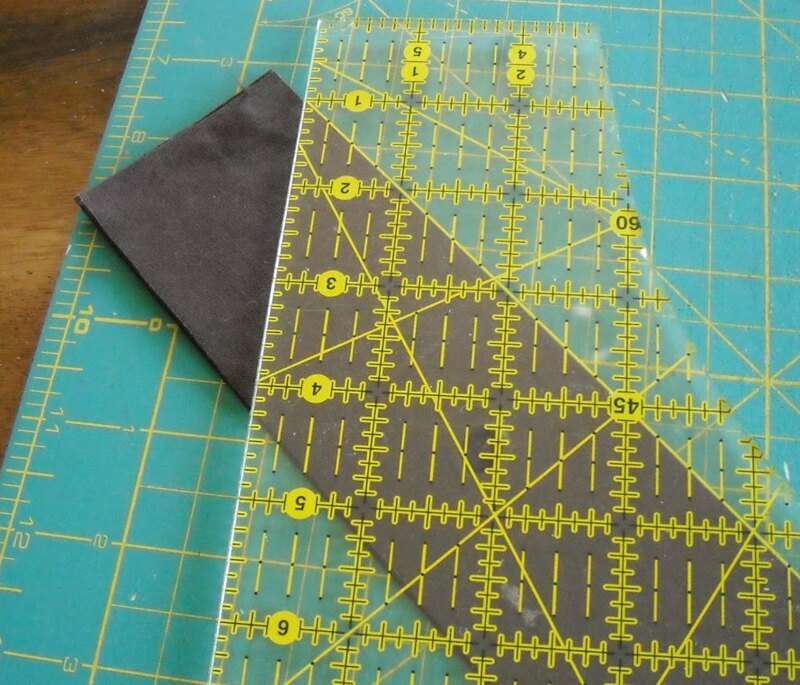 After I make the straightening cut, I like to unfold my fabric and lay the ruler along the center of the fabric to make sure it is straight. If it's not, sometimes I will try the folded technique again, or sometimes I will cut the edge straight while the fabric is unfolded. This requires carefully shifting the fabric as the whole width of it doesn't fit on my cutting mat. Now I am ready to cut strips. 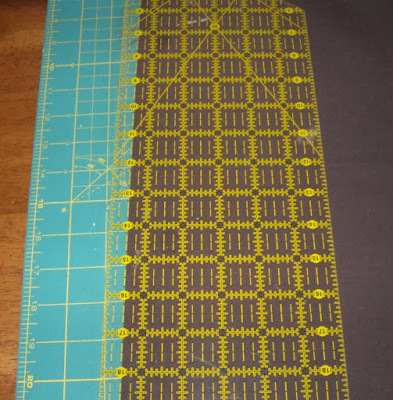 I move the bulk of the fabric over to the left of the ruler, so I can use the ruler to measure the width of the strip I am cutting (2 1/4 inches, here). It doesn't have to be perfectly lined up with the lines on the mat for this. 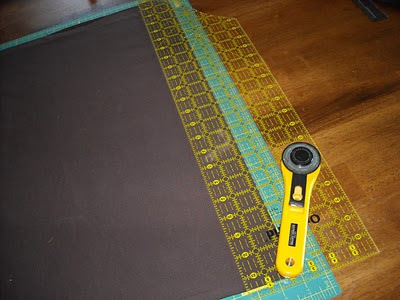 If you are going to be cutting several strips, it might be a good idea to unfold your fabric and check that it is still straight after 4 or 5 cuts. If I need to cut a strip that is wider than my ruler, then I use my mat to help measure. 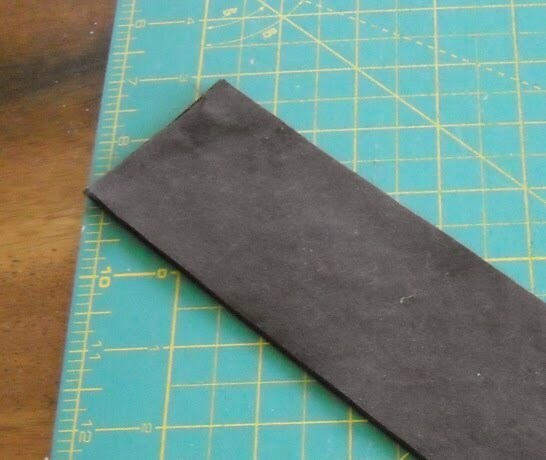 I make sure the edge of the fabric is lined up with a line on the mat, and then line up my ruler using the measurements on the edges of the mat. The above photo shows the set up to cut a 6 1/2" strip. 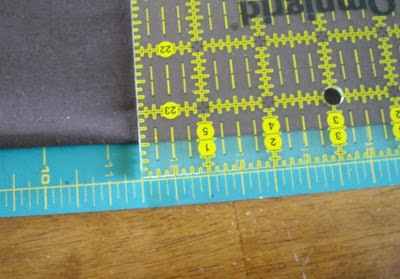 The left edges of the ruler are lined up with the 11 1/2" mark on both the top and bottom mat edges (see photo below). 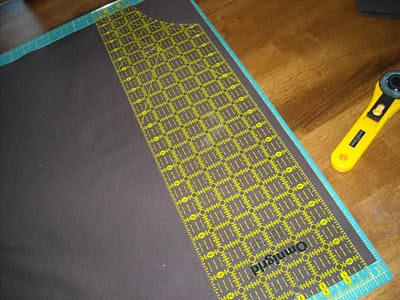 I also wanted to show how to use the 45 degree line on the ruler to cut the edges for binding strips. Line up several layers of fabric on top of each other. 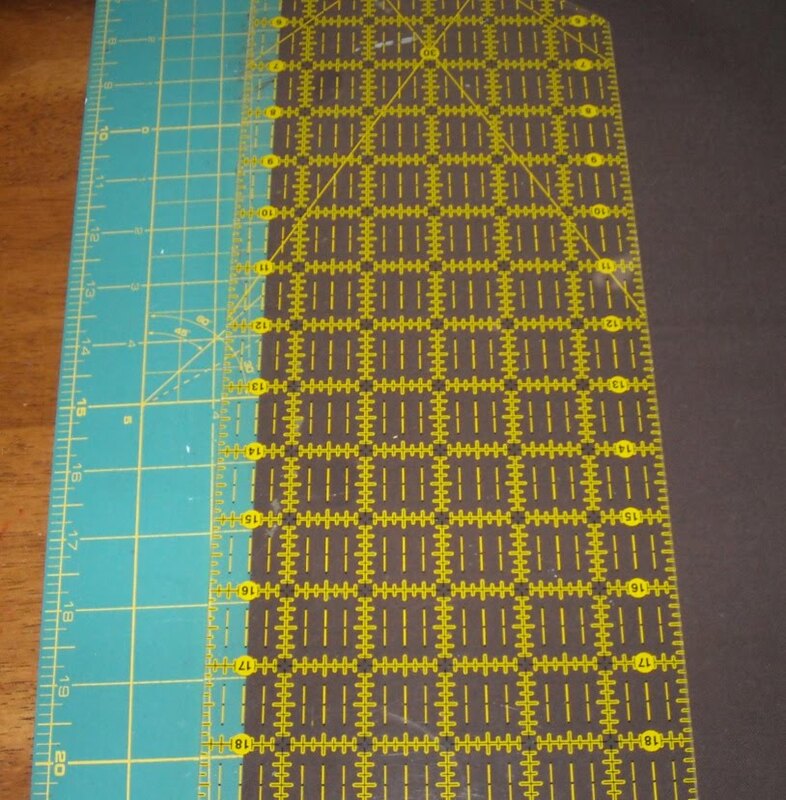 Place the 45 degree line along the long side of the strip, and cut. I hope this is helpful! I'd love it if anyone has feedback about this. Does everything make sense? Have I left anything out? Please let me know in the comments. Let's see how well cell phone pictures look here on the blog. I've been arranging the pieces for a circle quilt. My sister-in-law Amy C. (I have a SIL named Amy T. too) is having a baby girl this summer. This is going to be her quilt! This was the very quick I-finally-got-all-96-pieces-cut-out layout. Here it is after I changed it up a bit. Amy said she liked the first one better. 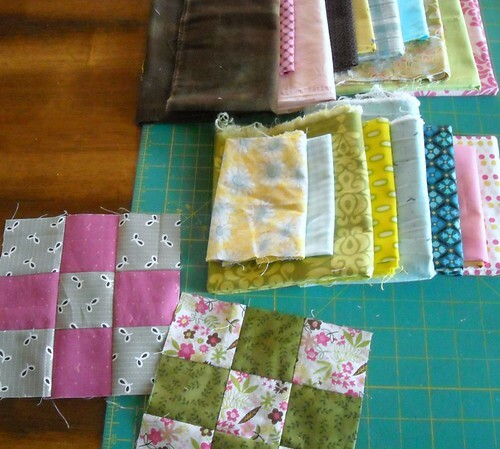 What I'm going to do is sew together all the quarter-circle and background square units so I have 48 pieces to deal with and then work on arranging them from that point. Something I thought about while I was cutting these was doing a little tutorial for how to make your own template to make this quilt block. And maybe my technique for cutting them, too. Is anyone interested in seeing something like that here? Natalia from Piece N Quilt is hosting an ugly quilt contest. I think it's a great idea! 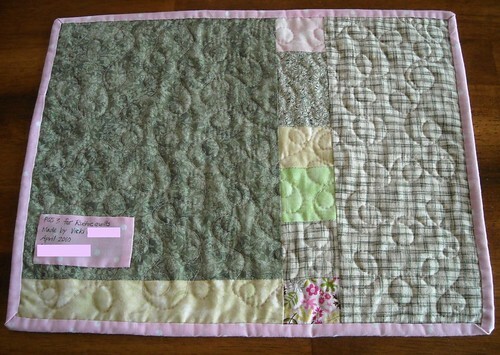 I've blogged about my ugly quilt before, it's also my first quilt. I decided to take a new picture of it. I had clothes made from at least two of these fabrics; maybe my mom can chime in if she remembers making clothes out of these fabrics for us. Or did Grandma make them? I had an outfit (pants and a vest maybe?) made from the turquoise print in the top left corner when I was 5, and lovely pants made from the fuschia/purple color that I remember from 3rd grade. In fact, that's when my mom chopped them off below the knee and made them into super-cute knickers. Come on, I know I'm not the only one that had knickers. These ones had a gold snap at each knee. Anyway. Back to the contest. You can enter any time between now and May 11. 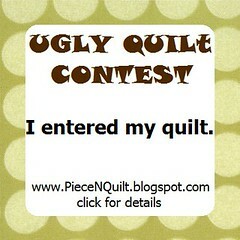 Prizes will be gift certificates to Piece N Quilt. Go here to find out more about entering!